Barack Obama took office three years ago on a euphoric wave of aspirations. Tens of millions in the United States and around the world pinned their hopes on this brilliant campaigner who promised "Change we can believe in" and proclaimed, "Yes we can!" In "Where Will Obama Go?" 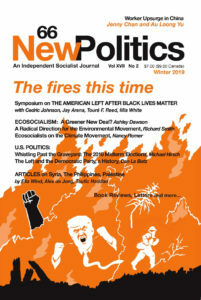 (New Politics, January 2009), I argued that a cursory look at Obama’s economic and foreign policy transition teams should have been sufficient to dampen the euphoria, since he was relying on the same individuals who had presided over the neoliberal policies of the preceding three decades, policies designed to increase profitability at the expense of the standard of living and institutions of the working class. In the United States, these policies were jump-started in 1979 by Jimmy Carter’s Federal Reserve chair, Paul Volcker. In 1979 Volcker pronounced, "The American standard of living must decline" as he ordered the "Volcker shock," monetary policy designed to reduce inflation and restore corporate profitability. The result was a worldwide recession in the early 1980s, which did indeed hurt American workers, but had a far harsher effect on Mexico (where it led to the 1982 collapse of the peso) and elsewhere in the Third World. Life-long Democrat Volcker praised Ronald Reagan’s union-busting as key to restoring profitability: After Reagan broke the Professional Air Traffic Controllers union (PATCO) in 1981, Volcker said "The most important single action of the administration in helping the anti-inflation fight was defeating the air traffic controllers’ strike". In 2008, shortly after his election, Obama named Paul Volcker to his economic transition team. Leading that team were Bill Clinton’s two Treasury Secretaries, Robert Rubin and Lawrence Summers. This pair, along with then-Federal Reserve chair Alan Greenspan, were architects of the deregulation that eventually blew up the financial markets in fall, 2008. They supported the repeal of the Glass-Steagall Act and pushed through the Commodity Futures Modernization Act of 2000, which included a blanket ban on government regulation of derivatives (in the process they conspired to destroy the career of Commodities Futures Trading Commission head Brooksley Bourne for warning that unregulated derivatives speculation would blow up the world financial system). If there is anything remarkable about Obama’s economic policy of the past three years, it is how much in line it has been with his Democratic presidential predecessors of the past thirty years. Obama’s prioritization of the financial industry and corporate profitability did not break new ground, but rather was continuing on the path of Carter, Clinton, and the New Democratic Coalition. However, when he first took office, Obama promised to make good on his campaign pledges for sweeping change. In his inaugural address, Obama proclaimed, "The state of our economy calls for action, bold and swift. And we will act not only to create new jobs but also to lay a foundation for growth. We will build the roads and bridges, the electric grids and digital lines that feed our commerce and bind us together." But Obama’s administration followed a far different path. Still more ominously, Obama appointed a protégé of Rubin and Summers, Timothy Geithner, to be Secretary of the Treasury. Geithner, president of the Federal Reserve Bank of New York, had done the bidding of the big Wall Street banks during the subprime crisis and financial market panic of 2008. As detailed in recent books by Robert Scheer and on Ron Suskind, he has faithfully transmitted and lobbied for the financial industry’s directives inside the Obama Administration. And, with his help, the financial services industry has committed highway robbery. Three years ago, amid the near-meltdown of the world financial system following the collapse of the housing bubble, it was evident that the big banks and Wall Street brokerages were responsible for the crisis. Yet now, Wall Street, politicians, and the media insist that public workers and public services caused this debt, and that there’s just no alternative to harsh austerity cuts to public programs and to the jobs, wages, and benefits of public workers. In short, the bad bank debt that triggered the crisis in 2008 never went away — it was simply shifted on to governments. Private debt became public debt. And as the dimensions of that metamorphosis became apparent in 2010, the bank crisis morphed into a sovereign debt crisis. Put differently, the economic crisis of 2008-9 did not really end. It simply changed form. It mutated. With that mutation, the focus of ruling classes shifted toward a war against public services. Concerned to rein in government debts, they announced an age of austerity — of huge cuts to pensions, education budgets, social welfare programs, public sector wages, and jobs. In doing so, they effectively declared that working people and the poor would pay the cost of the global bank bailout. The focus on slashing budgets at the expense of public jobs and essential services has had a devastating effect on state and municipal budgets, which were already under severe stress from the Iraq and Afghan wars’ siphoning of federal money away from public services and from changes to federal and state tax policies since the late 1970s that have sharply decreased taxes on corporations, capital gains, and the highest incomes. State budget deficits now total in excess of $200 billion (excluding pension liabilities), and states have responded by making across-the-board cuts to public programs. County and city programs can’t compensate for the cuts to state programs, because cuts in state funding and decreased tax revenue have triggered sweeping cuts in local programs. The pressure for more punishing cuts to local programs continues to increase: nationally, more than 100 cities are on the verge of declaring bankruptcy. We are told, "there is no alternative" to "shared sacrifice". Thus, Democrats and Republicans alike, in states across the country, insist that there is no alternative to the shared sacrifice of cuts to public programs and concessions on pensions, health benefits, and (often) compensation. They differ on the extent and the pace of the cuts. But for three years — or, at least until the 2012 elections appeared on the horizon — they agreed on the need for austerity. This is Barack Obama’s justification for a multi-year wage freeze for federal workers. It is the rationale of New York Democratic governor Andrew Cuomo and of California Democratic governor Jerry Brown for budgets that cut back on medical care and welfare for the poor, home services for the disabled, assistance for seniors, and funding for education. It is the excuse given by Wisconsin Republican governor Scott Walker for program cuts, for economic concessions from state workers, and for effectively eliminating collective bargaining for state worker unions (and it’s also the excuse given by Wisconsin Democrats for agreeing that the program cuts and economic concessions are essential.) It is the reason given by Michigan Democrat and then-governor Jennifer Grantholm for giving Robert Bobb dictatorial power over Detroit schools, the reason given by Bobb for closing down more than half of the city’s schools and increasing class size to over 60, and by Michigan’s Republican governor Rick Snyder for pushing through legislation allowing the state to put cities in receivership and thus disenfranchise the public from control of their community (this has happened to the city of Benton Harbor). In fact, the Democrats have a dual slogan: "there is no alternative to deep program cuts and economic concessions from public workers, unions, and pensions — but the Republicans’ proposal is even worse than ours." Thus, in California, Jerry Brown’s budget called for $12.5 billion in cuts and an equal amount from extending for another five years a "temporary" package of regressive taxes adopted under his predecessor (Republican Arnold Schwarzenegger), while the state’s Republicans proposed to get the entire $25 billion from cuts. Along these same lines, Wisconsin Democrats went along with Republican Walker’s proposals for economic cuts and concessions, but balked at his outright union-busting proposals. In state after state, variants of this scenario are being played out (Indiana, Ohio, Tennessee, Idaho, and Oklahoma) played out, as Democrats advocated program cuts and wage and benefit concessions while Republicans pushed for more onerous cuts and for stripping unions of collective bargaining and job protections. Ominously, in several states the Democrats initiated union-busting legislation—just slightly less onerous than the Republican proposals. In liberal Massachusetts, the Democratic majority in the state assembly voted to restrict health care bargaining rights for public workers. In Connecticut Democratic leaders in the state legislature supported a bill that would strip college faculty of bargaining rights by reclassifying them as managers. In Illinois the Democratic-dominated state legislature proposed and adopted legislation restricting teachers’ bargaining rights, seniority and job security, and right to strike. Despite the ubiquitous calls for shared sacrifice, it is hardly a secret that not everyone is sacrificing. Certainly not the "financial services industry" (aka Wall Street and the big banks) whose pre-tax profits are now 60 percent higher than they were before the onset of the 2008-9 Great Recession (which hasn’t stopped them from holding onto $2 trillion of the bailout loans). Not the rich, as Obama and Congress extended the Bush tax cuts that lower taxes for the wealthiest 2 percent and exempt estates worth as much as $5 million from inheritance tax. In the first quarter, the five companies with the greatest cash hoards — Microsoft, Cisco Systems, Google, Apple, and Johnson & Johnson — added $15 billion in cash and marketable securities to their balance sheets. Microsoft alone packed away roughly $9 billion, or $100 million a day. All told, the companies in the Standard & Poor’s 500-stock index are sitting on more than $960 billion in cash, a record…Cash is piling up faster than most industrial giants can possibly find a prudent use for it." Likewise, the banks are sitting on nearly $2 trillion in cash, $1.4 trillion of which were zero-interest loans from the Federal Reserve as part of the 2008 — 2009 bailout. The banks have parked this $1.4 trillion in Treasury bills paying 2.5 percent interest. So we the taxpayers loaned the banks $1.4 trillion interest-free, and we are paying them $35 billion per year in interest to hold onto that money. Meanwhile, the infrastructure erodes as state and municipalities fall deeper into debt and cut more jobs, pensions, and essential services. Business income [profits] is now 21.7 percent above the level reached before the recession. Yet the total compensation paid to workers in the corporate sector remains 5.7 percent below pre-recession levels, reflecting the reduced employment levels and hours worked in the sector. There is an old joke about the Lone Ranger, who turned to Tonto and said, "We’re surrounded by Indians," and Tonto responds, "What do you mean by ‘we,’ kimosabe?" The same logic applies to policymakers who claim that "we’re broke." It matters who is included in "we". … So are we broke? Only if we choose to be. Governments are broke because of the priorities they have pursued: the $16 trillion Wall Street bailout and consequent transformation of trillions of dollars of private debt into public debt, the huge and wasteful war budget, and the inverted tax policies that over the past 30 years have grossly lowered taxes on corporate and private wealth. Home mortgages: When the housing bubble burst and the financial markets teetered, the Bush and Obama administrations rushed to the aid of the "too big to fail" banks. But apparently, more than ten million working-class families were (and are) considered just the right size to fail. 10.4 million families owe more on their mortgages than the market value of their homes — that is, one out of every five families with mortgages. This is on top of the more than one million homes that were seized by banks in 2010, the 918,000 foreclosures in 2009, and the 850,000 seizures in 2008. Adding in homes seized in 2011 that makes more than one in every four family homes either seized or underwater since the subprime mortgage crisis broke in 2007. In contrast to the $16 trillion bank bailout, the Obama Administration has done next to nothing about resolving this crisis. The simplest solution to the housing crisis would be to reduce outstanding mortgage principal of a home loan to be no greater than that home’s market value. This could have and should have been done at the onset of the subprime crisis. It would have dramatically reduced the number of foreclosures by making homes affordable. By doing so, it would have alleviated the excess supply of unsold homes that exert a downward pressure on home prices, driving home prices down further and leaving more homeowners with mortgages that are underwater. This deepens the downward spiral: more underwater mortgages leads to still more defaults and foreclosures, which further increases the excess supply of unsold homes, etc. For nearly three years, the Obama Administration did next to nothing about the depressed housing market and the plight of millions of foreclosed and nearing-foreclosure families. Then in October 2011, with a presidential election year beckoning, Obama announced modifications to his policies. The new policies will only apply to homeowners with federally guaranteed home loans who are current on their mortgage payments — which eliminates those who have already lost their homes and those who are struggling the most. Furthermore, it will facilitate refinancing at a lower interest rate, but will not reduce the principal owed. This policy allows — indeed encourages — the banks to retain the inflated and fictitious valuation of their home loans. This enables banks to value such assets at two to three times their actual market value. Rather than resolving the toxic asset bubble, it perpetuates it. Rather than resolving the housing crisis, it extends it. And, judging on the execution of previous administration housing programs, the program is likely to remain largely on paper. Student loans: Total student loan debt is now over $1 trillion, and has surpassed total credit card debt. This is emerging as the next bubble: total student debt has increased by 511 percent since 1999, while average student income has only increased by 73 percent. Millions of students are graduating into unemployment or low-paying jobs burdened with five and six-figure outstanding student loans, which will effectively make them indentured servants of the banks for years to come, And continued high loan burdens and high unemployment spell high loan delinquency rates, which will sooner or later cause the student loan bubble to burst. The simplest solution to this crisis would be debt forgiveness. That would provide an orderly deflation of the student loan bubble, and it would be a big step in the direction of universal free higher education and away from the current direction of college only for the affluent or those willing to live much of their lives in hock to the banks. Instead, for nearly three years the Obama Administration did next to nothing. As with home mortgages, the Obama Administration waited until October 2011 to announce, with much fanfare, a student loan modification plan that does little to resolve the crisis or even alleviate the pain. Without going into details, suffice it to say that on average it will reduce student loan payments by an average of about $10 per month. Jobs: In September 2011, as part of his preparation for the 2012 election campaign, Obama finally admitted that the persistently high (9 percent) official unemployment rate reflects a jobs crisis. Amid much fanfare, he announced a jobs program that, again characteristically, does little to reverse "shared sacrifice." The proposed $447 billion is hardly adequate — it pales in comparison with the trillions dished out to the banks — but if that were its only problem, it would be better than nothing. But its real problems have received little or no attention in the media or from left-liberal pundits. Obama proposes funding the program in part from extending and increasing cuts to "the payroll tax," i.e., the Social Security tax. This from a president who has warned that Social Security faces a future funding shortfall. Decreasing social security funding may turn a minor funding shortfall into a major problem, which will be used to insist that Social Security must be reformed. Indeed, in this very same package Obama proposes "reforms" (read: cuts) to Social Security, Medicare, and Medicaid. Creating jobs at the expense of the income and health care of elderly and poor people is not a plan worthy of support, but it is characteristic of Obama’s overall austerity policy and a good illustration of what he means by "shared sacrifice". That this "jobs bill" proposal was greeted with near unanimous praise by left-liberal pundits (and economists, for example Paul Krugman and Robert Reich) — even heralded as the return of the "real" Obama — shows just how low expectations (and standards) have sunk. Now, in light of all of the above, let us consider the agreement arrived at last August between Obama and Republican Congressional leaders to make $3 trillion in deficit reductions, with the cuts to be determined by a bipartisan Congressional super committee. Was this the product of Republicans battering down a reluctant but weak or outgunned President? Or was it an arrangement between two sides that — as Barack Obama has said on numerous occasions — agree on the need for austerity but disagree on its extent, its pace, whether to require even minimally higher taxes on the wealthy, and just how much to squeeze out of working and unemployed people? Our answer should be obvious. Sure, the Republicans are "worse," in the sense that they demand deeper cuts, bigger tax breaks for corporate and individual wealth, and harsher attacks on labor. And of course, as mass movements emerge against austerity and for providing the basics that all people need to live decently and with dignity, Obama will move left in rhetoric and, perhaps, adapt his policies modestly. But will he break with the priorities of finance capital and place human needs ahead of "shared sacrifice" austerity? Not likely. And certainly, the engine for change will not come from within the White House or Capitol Hill. But recently, a source of change has appeared on the horizon. After decades of gross increase in the share of the wealthiest at the expense of the rest, after years of prioritizing profits before basic needs, and after the decimation of public education, home ownership and housing in general, health care and public health, roads and bridges and the rest of the infrastructure — after hope appeared extinguished, it has burst back on the scene. The Occupy Wall Street phenomenon, and the Occupy movements it has inspired around the nation and around the world, is an elemental rising up against the social system and its political representatives. There is widespread and growing sentiment that the system must be changed, but cannot be changed by reforming the system from within or by relying on the Democratic and Republican politicians who, in the movement’s idiom, serve the 1 percent against the interests of the 99 percent. In any event, Barack Obama has not brought "Change we can believe in." He has been the man who stole the hope that so many invested in him. Fortunately, today that hope is back. As I marched with thousands of others in the November 2 Strike and Day of Mass Action organized by Occupy Oakland, I could feel the return of a mass movement and, moreover, one that is global in scope and that insists that we can and will create a society that puts the needs of the overwhelming majority before the priorities of finance and corporations. That is the source of authentic hope for real change that we can believe in. 3. David McNally, Global Slump: The economics and politics of crisis and resistance. (Oakland: PM Press, 2010), 2. 9. Kim Moody, "Wisconsin and beyond" (Against the Current 152, Spring 2011), 13-17. 10. Lawrence Mishel, We’re not broke nor will we be. (EPI briefing paper #310. Washington, D.C.: Economic Policy Institute, 2011), 7. JACK GERSON is an Oakland-based writer and activist. He was a founder of the Occupy Oakland education outreach committee and of the Oakland Education Association’s campaign to bail out schools and services, not banks. He chaired the committee that organized the March 4, 2010, Strike and Day of Action to Save Public Education in Oakland.